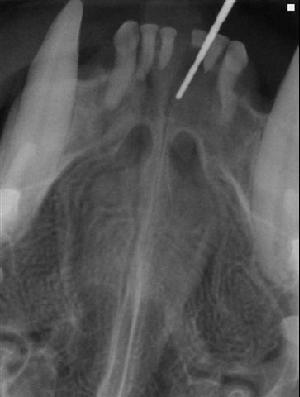 It is virtually impossible to practice veterinary dentistry without dental radiographs! Dental radiology is the most vital tool in veterinary dentistry. Dental radiographs ( X-rays) are essential in making an accurate diagnosis. The diagnosis is the basis for understanding the prognosis, and in deciding how to treat our patients. Dental radiographs are essential in performing dental procedures, in evaluating procedural success and in documentation of dental and oral health. Please say "no Thank You" to any dental procedure including teeth cleaning without dental x-rays. Why would you want dental radiographs when teeth cleaning? We provide a comprehensive oral health assessment and treatment (COHAT) for pets when the teeth are cleaned. Dental x-rays with periodontal probing help with the assessment. It makes no sense to place an animal under anesthesia to clean their teeth, and miss an important problem. If you don't look (take x-rays), you most likely will not find problems that need attention. 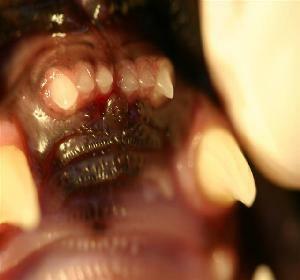 Two thirds of our dog's and cat's teeth are under the gingiva (gums), and are not viewable. Dental radiographs help in the assessment. They allow assessment of the teeth (fractures or internal disease), the surrounding soft tissues (periodontal disease, stomatitis, CUPS, cysts, draining tracks, facial swellings, fistulas or tumors), the joints (TMJ or mandibular symphysis) and of the bone (jaw fractures). Dental radiographs can reveal subgingival (under the gums) foreign objects, cysts and tumors. Studies have shown that without dental radiographs, significant pathology is missed in up to 75% of pets. Diagnose first, establish treatment plan, then treat meticulously! Consider a pet that is rubbing the face, gulping or excessively salivating, and you don't see a reason for these behaviors. Would you just hope for the behavior to go away without treatment? Providing antibiotics and or steroids (without a diagnosis) is rarely a beneficial treatment on a long term basis, and may be harmful for the pet. Indiscriminate use of antibiotics may be harmful to pets and people by creating resistant bacteria (for more information, Google MRSA). Dental radiographs may identify a foreign object entrapped between the teeth, or in the gingival sulcus. The logical treatment would obviously be to remove the foreign object. This problem will not resolve with the use of medications alone! We always diagnose first, plan the best treatment and perform the necessary treatment meticulously. Dental radiology replaces a guess with a diagnosis, and allows for the correct treatment to be optimally performed. Dental radiology for the young patient. Dental radiographs help determine whether teeth might be abnormal, malpositioned, missing, non-vital (dead) or vital (alive). This first case could not be diagnosed or treated without dental radiographs! Dental extraction was appropriately performed. Second young patient being evaluated for normal developing teeth! This evaluation would not be possible without dental radiographs. Persistent primary (baby) canines must be removed when secondary (adult) canines have erupted to avoid malocclusion development. Persistent right primary canine (baby) tooth. Persistent right primary upper canine tooth. Notice how thin the primary tooth is. 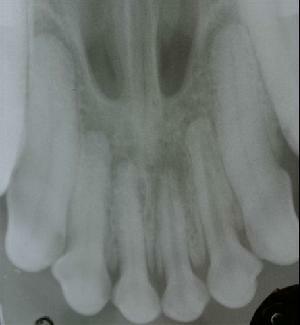 Root tip fracture of the primary tooth. tip. Note the missing premolar tooth! 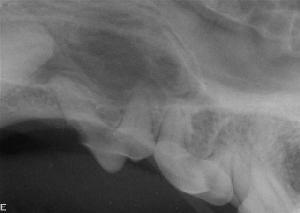 Adult dog with dental malformation and malpositioned secondary tooth with persistent primary premolar teeth. This dog would rub the face vigorously. secondary tooth just below the eye. completely extracted without dental radiographs. Dental radiographs identify abnormal dilacerated (curved) roots. the primary (baby) teeth failed to erupt. Every time a tooth is missing, a dental radiograph is required. Unerupted teeth can cause dentigerous cyst formation. These cysts are locally destructive and can result in jaw fracture or facial swelling. Left facial swelling; extraoral view. Left facial swelling intraoral view. Cyst formation in left maxilla (upper arch). Embedded tooth removed from the cyst. is free of dental remnants. Similar case of a missing tooth on the mandible (lower jaw). premolar tooth appears to be missing. jaw to avoid jaw fracture. Dental radiographs are essential for performing root canal therapy. Radiographs needed to perform root canal therapy. Dental radiographs are needed to evaluate teeth for restorations. Restoration of canine tooth defect. Radiographs help with diagnosis and with treatment. Severe stage 4 of 4 periodontal disease. should be a simple procedure! to find and remove these root tips. 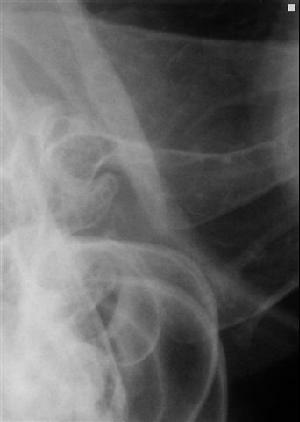 Radiographs are critically important to help this patient with chronic pain. Dental radiographs can help with the diagnosis, treatment and elimination of pain! offers the best long term prognosis. Severe periodontal disease is diagnosed with dental radiography and periodontal probing. Dental radiographs are needed to perform dental extraction. 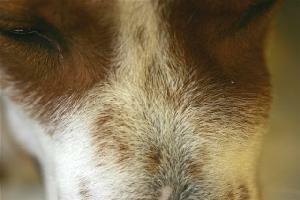 Discolored teeth are likely to be non-vital (dead), and a health risk for companion animals. Infection can spread from non-vital teeth, through the bloodstream, and throughout the body! the evaluation of these teeth. Dental radiographs are essential in the extraction of this fractured tooth. the extraction of this lower canine tooth. screaming and pawing at her face! Dental radiographs are needed for the diagnosis, treatment planning and the repair of jaw fractures. Cat; jaw fracture behind the molar tooth. 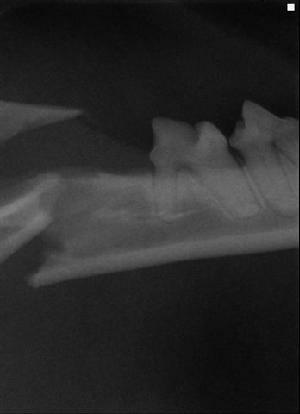 Dog; bilateral jaw fracture; complication from dental extraction. Fractuerd teeth must be evaluated with dental radiographs. lower fourth premolar) tooth roots. The "TMJ" is a hinge joint responsible for the opening and closing of the mouth. Dental radiographs can be very useful in the evaluation of the TMJ. 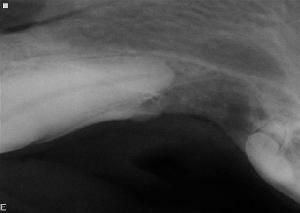 Dental radiograph of the "TMJ". 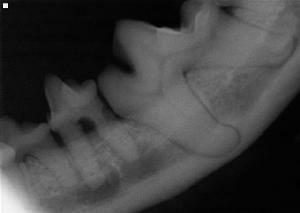 Dental radiography is essential to perform every aspect of veterinary dentistry.